Coordinating purchase orders and sales history with your accounting system can help standardize operational data. Inventory Planner integrates in two ways with Quickbooks Online: one as an accounting integration and one as the primary sales integration with Inventory Planner. Note that this integration works with Quickbooks Online, but not Quickbooks Desktop. Integration 1: Push Purchase Orders from Inventory Planner to Quickbooks Online. In the accounting integration option, you will use a platform other than Quickbooks to provide sales history and product information to Inventory Planner. Click here to see a full list of available integrations. When you push a purchase order from Inventory Planner to Quickbooks Online, Inventory Planner creates an identical PO with the same products, quantities, cost that you see on the PO dashboard side. Before saving a PO you need to make sure that all products are created in Quickbooks. Otherwise you will get an error - Inventory Planner doesn't create products in Quickbooks automatically. Purchase Orders and you can enable saving POs to Quickbooks. Then after you've created a new purchase order, you'll see the option to Save to Quickbooks. If Quickbooks Online contains all store product information and sales orders from customers, then it can be used as the primary platform to integrate with Inventory Planner. In this case, the daily sync with Inventory Planner will pull in new sales information and any updates to products including stock levels. Purchase Orders can still be pushed from Inventory Planner to Quickbooks Online. 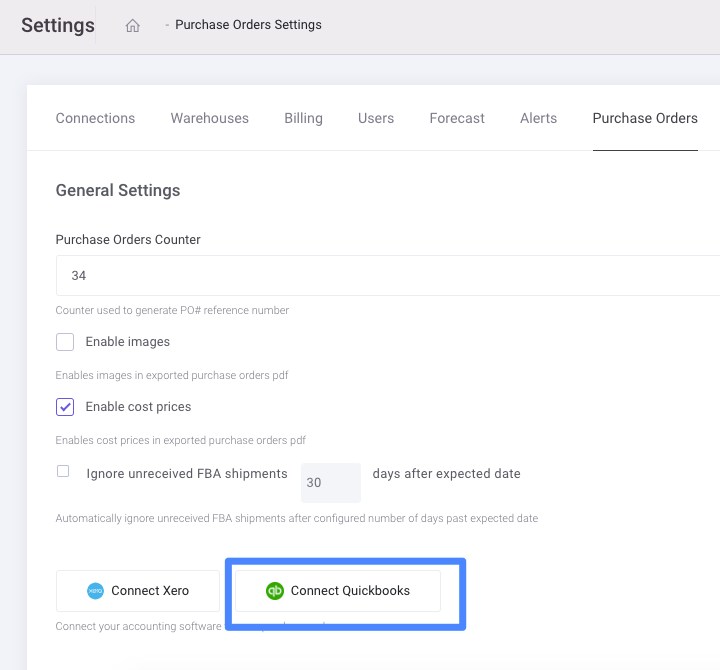 Learn how to connect Quickbooks Online as your sales integration to Inventory Planner.